The end of the Second World War demonstrated the importance, for the cavalry, of having heavily armored reconnaissance vehicles that are fast on the road and agile on rugged terrain. The army thus developed specifications for a highly mobile, long-range wheeled armored reconnaissance vehicle, weighing less than 12 tonnes and armed with a 75 mm cannon that could fire mortar shells with an initial speed of 600 m/s. Four manufacturers were invited to present projects. At Panhard & Levassor, Louis Delagarde had already designed an armored car prototype in 1938: the AM 201. Its originality lay in replacing the tracks with 8 wheels, of which the 4 inner steel wheels were retractable. In 1945, he went back to work on his original project and improved it. The flat, 12-cylinder Panhard engine meant that an operator cab could be housed at each end. The practically symmetrical armored hull was designed for greater resistance. 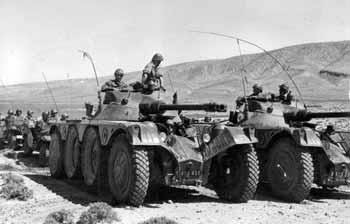 The Panhard & Levassor EBR armored reconnaissance vehicle was chosen by the army in 1949 and became an emblematic vehicle used from the nineteen-fifties to the beginning of the 1980s.